The luxurious cruise theme of this 5 reel and 15 payline iSlot begins at a Travel Agency and sets of on randomly chosen destinations via the Bonus Feature. iSlots is like a story and the gambler will advance to the next stage as he progresses through the game. There are four games in one, each with their own design, icons and Bonus features, which guarantees players hour of entertainment. 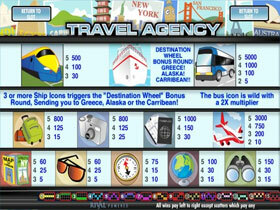 The Travel Agent Wheel rewards players with coins or "spin again" prizes. Each 'Cruise' is structured differently and players could be send off on a Caribbean, Greek or even an Alaskan cruise. 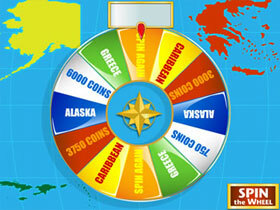 The Greek cruise contains a Free Spin round while the Caribbean cruise has two Bonus Rounds. The Alaskan cruise boast with a Single-Player Bonus Round which is Bingo. Every session promises to be different and has built in re-playability for players who just can't get enough. 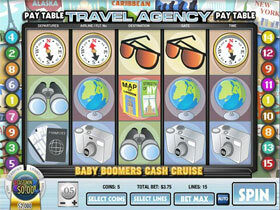 The high quality graphics, animations and laid back sound effects all add to the excitement of this iSlot together with well-designed icons that are associated with a cruise, such as the Globe, a Sun glass, a Map of London, Helicopters, a Compass, a Camera, Binoculars, a Passport, a Bus, a Train and a Luggage bag.